The 2018 West Virginia Book Festival will feature authors such as Debbie Macomber, David Grann, Dennis Lehane, John Scalzi, Kwame Alexander, Jill Lepore and more. In addition to author presentation and signings, there will be workshops and the annual Kanawha County Public Library used book sale. The festival will occur from Thursday, October 25th through Saturday, October 27th. All events on Friday and Saturday will occur at the Charleston Civic Center, Charleston West Virginia. Debbie Macomber is a #1 New York Times bestselling author and one of today’s most popular writers with more than 170 million copies of her books in print worldwide. In her novels, Macomber brings to life compelling relationships that embrace family and enduring friendships, uplifting her readers with stories of connection and hope. Macomber's novels have spent over 750 weeks on the New York Times bestseller list. Eight of these novels hitting the number one spot.In 2014, Macomber's all-new hardcover publications will include Blossom Street brides (March), Love Letters: A Rose Harbor Inn Novel (August) and Mr. Miracle (October) and paperback editions of the #1 bestseller Starting Now (April) and her acclaimed Christmas novel, Starry Night (October). In addition to fiction Macomber has also published two bestselling cookbooks; numerous inspirational and nonfiction works; and two acclaimed children’s books. Macomber's beloved and bestselling Cedar Cove Series became Hallmark Channel’s first dramatic scripted television series, Debbie Macomber's Cedar Cove, which was ranked as the top program on cable when it debuted in summer 2013. Hallmark is now filming a second season of Debbie Macomber's Cedar Cove which will premiere this July 19. In addition, Macomber’s upcoming Christmas novel, Mr. Miracle, will be made into an original movie premiering on Hallmark Channel in fall 2014. Previously, Hallmark Channel has produced three successful Christmas movies based on Macomber's bestselling Christmas novels, Mrs. Miracle, Call Me Mrs. Miracle and Trading Christmas. Macomber owns her own tea room, Victorian Rose Tea Room & yarn store, A Good Yarn, named after the shop featured in her popular Blossom Street novels. She and her husband, Wayne, serve on the Guideposts National Advisory Cabinet, and she is World Vision’s international spokesperson for their Knit for Kids charity initiative. A devoted grandmother, Debbie and her husband Wayne live in Port Orchard, Washington (the town on which her Cedar Cove novels are based) and winter in Florida. Displaying results 1-15 of 19 titles for "Debbie Macomber"
(Alpine) Author Talk and booksigning with Debbie Macomber, for her new book Inn at Rose Harbor. About the Book: From #1 New York Times bestselling author Debbie Macomber comes a heartwarming new series based in the Pacific Northwest town of Cedar Cove, where a charming cast of characters finds love, forgiveness, and renewal behind the doors of the cozy Rose Harbor Inn. 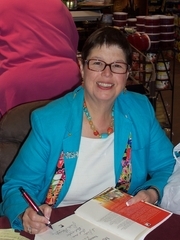 About the Author: Debbie Macomber, the author of A Turn in the Road, 1105 Yakima Street, Hannah’s List, and Twenty Wishes, is a leading voice in women’s fiction. Seven of her novels have hit #1 on the New York Times bestseller list, with three debuting at #1 on the New York Times, USA Today, and Publishers Weekly lists. Debbie Macomber’s Mrs. Miracle (2009) and Call Me Mrs. Miracle (2010) were Hallmark Channel’s top-watched movies for the year. Debbie has more than 160 million copies of her books in print worldwide. Drop in to knit, crochet, eat snacks and discuss this month’s book, An Engagement In Seattle by Debbie Macomber. Debbie Macomber's book Silver Linings was available from LibraryThing Early Reviewers. Debbie Macomber's book Last One Home was available from LibraryThing Early Reviewers. Debbie Macomber's book Starry Night was available from LibraryThing Early Reviewers. Debbie Macomber's book Mr. Miracle was available from LibraryThing Early Reviewers. Debbie Macomber's book Rose Harbor in Bloom was available from LibraryThing Early Reviewers. Debbie Macomber's book Love Letters was available from LibraryThing Early Reviewers. Debbie Macomber's book Blossom Street Brides was available from LibraryThing Early Reviewers. Debbie Macomber's book The Inn at Rose Harbor was available from LibraryThing Early Reviewers. Debbie Macomber's book Starting Now was available from LibraryThing Early Reviewers. Debbie Macomber's book Angels at the Table was available from LibraryThing Early Reviewers. Debbie Macomber's book Family Affair was available from LibraryThing Early Reviewers. Debbie Macomber is currently considered a "single author." If one or more works are by a distinct, homonymous authors, go ahead and split the author. Debbie Macomber is composed of 16 names. You can examine and separate out names.